The Drobo B1200i 12-bay iSCSI SAN storage is optimised for Small and Medium Business (SMB) IT to provide reliable, high-performance, and self-optimising storage for server virtualisation, email, and data protection. Coupled with innovative Automated Data-Aware Tiering, the Drobo B1200i delivers a level of automation and technical sophistication usually reserved for more expensive enterprise solutions. It integrates seamlessly into your TCP/IP network infrastructure and utilises the industry-standard iSCSI protocol to provide powerful, yet simple, consolidated storage for your IT environment. Featuring twelve-drive capacity, multi-host support, three iSCSI ports, and up to 255 Smart Volumes, Drobo 12-bay iSCSI SAN storage for Business delivers features and performance traditionally reserved for more expensive solutions. Modular design The B1200i delivers enhanced availability and serviceability for environments hosting business-critical applications Support for high-performance drives SAS or SATA mechanical disks in the same system, support for SSDs Data-Aware Tiering The intellegence built into the Drobo model B1200i allows it to optimising data layout and drive useage for "hot" workloads. Built on proven BeyondRAID technology, coupled with hybrid storage and innovative data tiering, the Drobo B1200i delivers a level of automation and technical sophistication usually reserved for more expensive enterprise solutions. And, this product is as easy to use as a personal Drobo. The Drobo B1200i is perfect for small and medium sized businesses. It provides reliable, high-performance, and self-optimising storage for server virtualisation, email, and data protection. It integrates seamlessly into a TCP/IP network infrastructure and utilises the industry-standard iSCSI protocol to provide powerful, yet simple, consolidated storage for your IT environment. Built on our award-winning BeyondRAID technology, the Drobo B1200i protects your data without any intervention – even in the event of multiple drive failures. You can even switch from single to dual disk redundancy with a single click, ensuring enterprise-level dual parity data protection when required. Drobo’s with BeyondRAID are also self-healing and have virtual hot-spares. If a drive happens to fail, Drobo will automatically re-layout the data to return to a protected state without disruption. To further enhance your experience, every Drobo comes with Smart Volume technology. Smart Volumes are thinly provisioned volumes that automatically utilise capacity as needed from a common pool of storage. Additionally, as data is deleted, free capacity is returned to that common pool, immediately increasing the available capacity. If you’re running low on space, the lights on the front of the Drobo B1200i tell you exactly what to do. The innovative, user-friendly industrial design allows you to add or hot-swap larger capacity drives, without tools, on the fly, for storage expansion with zero downtime. Expand your capacity without missing a beat while safely storing, sharing and backing up all your data with ease and peace of mind. It’s that simple! The Drobo B1200i moves beyond the days of manually tuning an array for applications that have different storage requirements. Automated Data-Aware Tiering leverages high-capacity hard disk drives (HDDs) paired with high-performance solid state drives (SSDs) to deliver application-optimized storage that requires no manual tuning. Unfamiliar with iSCSI? iSCSI is a popular high-performance protocol for deploying storage networking technology in IT environments. The problem: it can be very complex to manage. 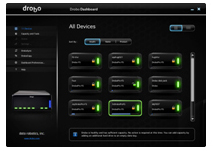 The Drobo B1200i changes that by introducing zero-click iSCSI configuration for both Windows and Mac OS X servers. With an iSCSI SAN, centralized storage is provided to each server over a high-speed Gigabit Ethernet network where it can be allocated or expanded instantaneously. Deploying a Drobo B1200i eases iSCSI adoption, simplifies administration, and allows you to consolidate storage so you have fewer devices to manage. The B1200i is the first Drobo with serviceable modular components. This hardware design provides a removable controller card, dual-redundant hot-swappable power supplies, and a hot-swappable cooling fan unit. You can source field replaceable units for protection against a single hardware component failure to ensure maximum availability. 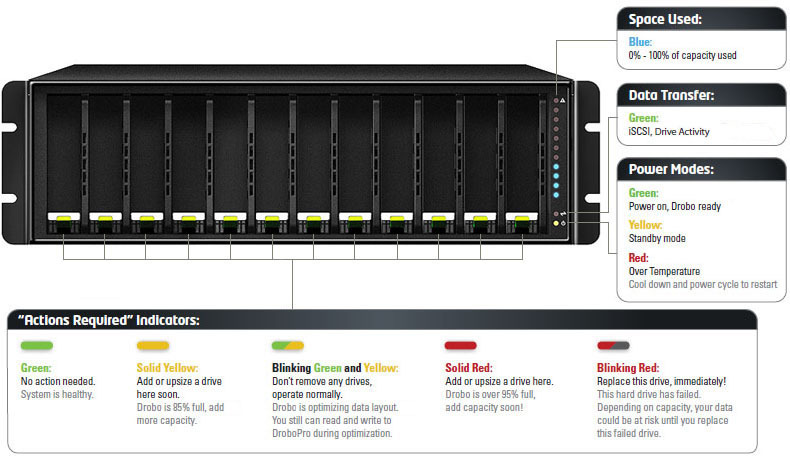 The Drobo B1200i delivers the high level of availability demanded by virtualized IT environments. 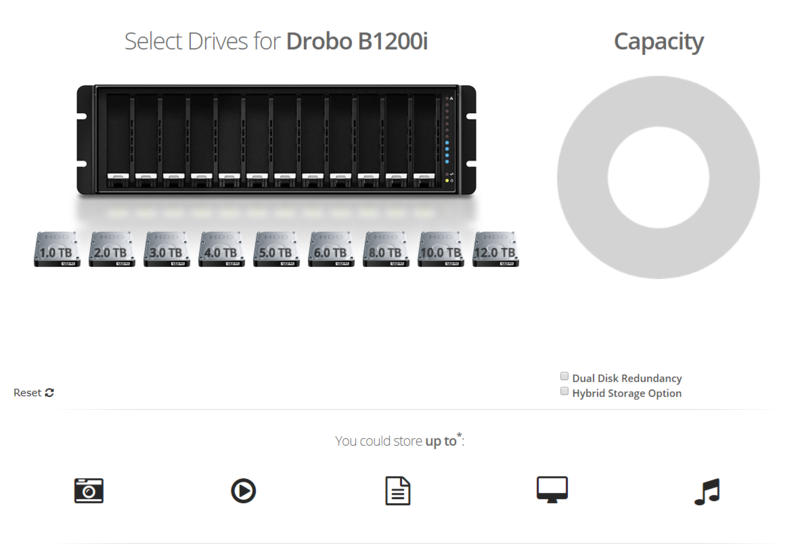 The Drobo B1200i is ideal for building your first scalable backup server or server virtualization cluster. It is certified for VMware vSphere, Symantec Backup Exec and Veeam Backup environments. Our volumes are just smarter. Thin provisioning through Drobo’s Smart Volumes provides on-demand allocation of storage providing maximised capacity utilisation. Smart Volumes are a virtual volume architecture that pull needed storage, on-demand, from a common pool (thin provisioning) and then return any deleted blocks back to the common pool (thin reclamation), allocating these newly available blocks to free space immediately available for new data. Whether you are building an SAN for the first time, scaling out an application, or implementing a server virtualisation cluster, Drobo provides sophisticated yet easy-to-use networked storage for your IT environment. 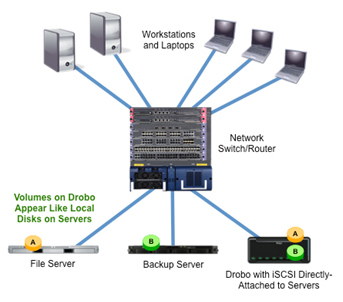 Utilising the industry-standard iSCSI protocol, Drobo connects to your existing TCP/IP Ethernet network to consolidate storage and centrally share it with your servers. iSCSI (pronounced "i-scuzzy") is an Internet Protocol (IP)-based storage networking standard for connecting storage arrays to computers, using high performance Ethernet. iSCSI is an industry-standard protocol, allowing organisations to consolidate and centralise storage while providing servers with the illusion of locally-attached disks. Unlike traditional Fibre Channel storage, which requires special-purpose cabling, iSCSI can be run over the existing Ethernet network infrastructure. To enable use of drives of different sizes, the Drobo virtualisation layer (see BeyondRAID section) sits on top of the physical drives. 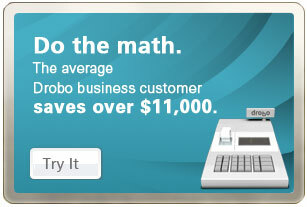 Because Drobos are data aware, data is placed intelligently in the best place on the drives. With the introduction of SSD support in the Drobo B1200i, SSDs provide a faster tier of storage for data that is transactional in nature, the type of data that benefits from the faster write and access speeds SSDs provide. 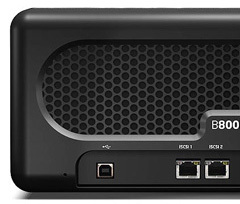 The modular design of the B1200i model delivers enhanced availability and serviceability for environments hosting business-critical applications. This allows fans and power supplies to be replaced without taking the Drobo down. Even the faceplate is magnetic, with the manual on the back. Primary management is by using drive status lights and visual capacity gauge. The intellegence built into the Drobo model B1200i allows it to do Data-Aware Tiering, optimising data layout and drive useage for "hot" requests. Providing faster access to frequently requested information will improve performance of Exchange, SQLServer, and other transactional applications that read and write lots of small data chunks. The Drobo B1200i moves beyond manually tuning an array for applications that have different storage requirements. Its ability to automatically tier frequently used transactional data from stored data that’s seldom used enables businesses to consolidate storage resources, and share that storage across all connected servers and their applications. When using the hybrid storage option, Drobo leverages high-capacity hard disk drives (HDDs) and high-performance solid state drives (SSDs) to deliver application-optimised storage solution that requires no manual tuning. Drobo B1200i storage pools have increased as disk drive suppliers have grown the capacity of their Enterprise quality SAS and SATA drives. 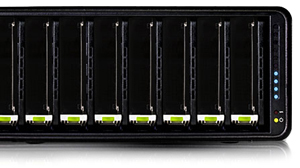 This Drobo supports a storage pool of 128TBs. Quickly create new volumes, up to 64TB in size, and manage them with ease. 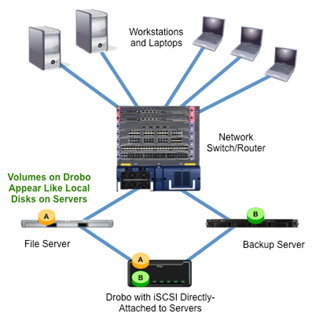 The innovative and timesaving Smart Volumes management technology with Thin Provisioning integrated into the Drobo B1200i allows the creation of up to 255 volumes. 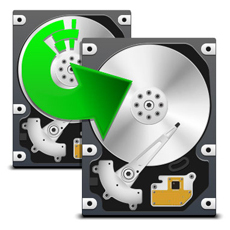 These volumes pull storage from the common pool of disks rather than silo’s of physical disks. 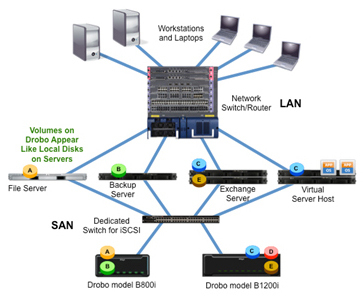 Similar to business applications, Drobo is ideal for building a server virtualisation cluster, highly available email server, or scalable backup server. Drobo technology has been certified for VMware vSphere, Symantec Backup Exec, and Veeam Backup environments. The B1200i is the first Drobo with serviceable modular components: removable controller card; dual-redundant, hot-swappable power supplies; and a hot-swappable cooling fan unit. You can source field replaceable units in advance, to protect against a single hardware component Built on proven BeyondRAID technology, this is applicationoptimised storage for small and medium sized businesses failure. This ensures maximum uptimes and delivers a higher level of availability demanded by virtualised IT environments. The Drobo B1200i model connects seamlessly to your existingTCP/IP network and utilises industry-standard iSCSI protocol with optional CHAP authentication to provide simple, consolidated iSCSI storage for your servers. Drobo B1200i model and its underlying BeyondRAID technology currently support the Windows and Mac platforms, with file system support for NTFS, HFS Plus, and FAT32. Since Drobo B1200i is a block-level system, it easily adapts to almost any environment. Utilising dual-disk redundancy, B1200i model's BeyondRAID technology can ensure your data is safe even if up to two drives fail simultaneously — all without a moment of downtime. 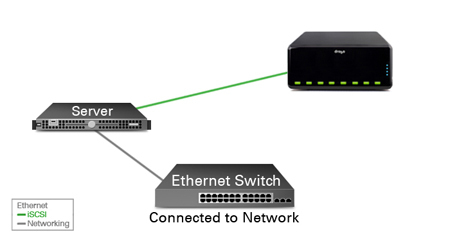 You can even switch between single- and dual-disk redundancy with a single click. 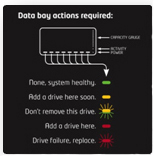 You'll feel safer knowing that if drives do fail, Drobo B1200i model automatically enters a state of self-healing in which it relays out your data across the remaining healthy drives and sectors. 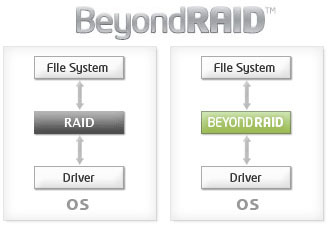 If a drive fails, BeyondRAID technology always returns the drive array back to the safest state possible. When B1200i model detects a "bad" hard drive, it proactively advises you with a series of warnings ranging from a blinking red LED on its front panel, to pop-up alerts in Drobo Dashboard and email alerts. What B1200i model does next is exceptional. It enters a self-healing mode where it repairs around the bad sector or drive, and works until it returns to the safest state possible. If B1200i model has sufficient time and free capacity (indicated by all lights returning to a solid green state), it can even withstand additional hard disk failures — that's the power of self-healing. B1200i model is iSCSI SAN storage that manages itself. There are no complex configuration screens, confounding choices, or other complications that prevent so many other storage devices from working out of the box. For companies that need simple, consolidated storage for multiple servers but don't want to deal with the complexities of traditional SANs, B1200i model is the ideal solution. Setup can be completed in a matter of minutes and routine tasks such as expanding capacity are as simple as adding a drive or replacing the smallest drive in the array. 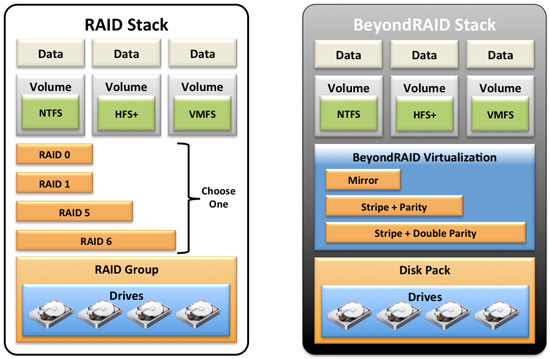 No need to back up data or re-create a RAID array. B1200i model will automatically recognise the additional capacity and make it immediately available to all Smart Volumes and applications. BeyondRAID was designed from the ground up to allow the storage capacity of the array to expand and contract. BeyondRAID makes this a simple process by utilising a technology called "virtualisation." Virtualisation provides a layer of abstraction between the data requested, by the file system, and the physical location of that data on the disk drives. A given piece of data can be located on any drive, and on any physical location on that drive. This is what makes adding a drive to a B1200i model so simple. The new drive just provides additional places to store data. Virtualisation is what enables BeyondRAID to effortlessly change the data arrangement on the drives, for example, changing data stored as a mirror into data stored as parity stripe without interrupting the user access to data. Virtualisation completely decouples the physical space available in the array from the space reported to the operating system. This is how BeyondRAID is able to eliminate the need to manually expand/contract the file system as more space becomes available or is removed. One long-standing requirement inherent in traditional RAID-based systems was that, if for some reason you needed to remove the drives, you'd have to replace them in the exact same order. When you remove your disks from B1200i model, you can put them back in any order you like. 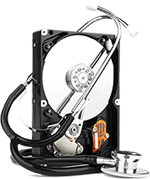 Up to to 12 3.5" SAS 1/2 or SATA I/II/III hard drives or 2 to 3 solid state drives (with up to 9 hard drives). Drives of any manufacturer, capacity, spindle speed and/or cache can be used. No tools or carriers required for 2.5” SSDs.